Have allergies and looking for an effective dry carpet cleaner? Looking for a safe cleaner to use on your wool rugs? Searching for a cleaner with no bleach, solvents or harsh chemicals? Capture Carpet & Rug Dry Cleaner is the answer to these, and more of these types of situations. In sea of carpet cleaning products, Capture is your lifeboat to the Isle of Clean Carpets. Ok, a bit corny, but unlike traditional ChemDry Cleaning Systems – you won’t have to purchase/rent large machines or hire professionals. And that in itself is a life (carpet) saver. How often to use: Depends on how much traffic an area gets. Use weekly for remove spots as they occur or monthly for high traffic areas such as entryways or kitchens. What you need: Dry Carpet Powder, Pre-Mist Soil Release Spray, Standard Cleaning Brush, Vacuum, and Sifter (purchase a simple kitchen flour sifter. Cleaning can be used without this, but it will make the process easier). Step 1) Lightly spray soiled area with Capture Soil Release Pre-Mist. This product loosens set-in stains. For heavily soiled areas – gently brush the Pre-Mist into the carpet before sprinkling the dry powder. Step 2) Sprinkle the dry cleaning powder liberally to cover the stain/area. This is where the sifter comes in handy. Step 3) Lightly brush the area with the standard cleaning brush. The powder cleans by absorbing stains and keeping them contained as it dries. You may want to use a stand up Brush for larger areas. Step 4) Wait at least 30 minutes before vacuuming up the Capture Powder. -If this is your first time using Capture Dry Carpet Cleaner – purchase the Capture Carpet and Rug Dry Cleaning Kit. It comes with everything you need to get started: Pre-mist Spray, 2.5 lb powder, and carpet brush. -Start with a fresh bag or empty chamber in your vacuum cleaner for maximum suction. -One pound of Capture Dry Powder cleans 100 square feet of carpet. I like the helpful information you provide in your articles. i will bookmark your weblog and check again here frequently. I am quite certain I will learn plenty of new stuff right here! Good luck for the next! 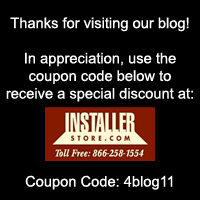 Installerstore Facebook Installerstore is on Facebook! Stay involved with discount updates and new products! Share your thoughts and ideas with us. Installerstore Flooring Distributor of Karndean, Marmoleum Click, EcoDomo, and More! Installerstore.com- Ebay Store Find deals on discontinued registers, cleaners, stair rods, and more! Installerstore.com- Everything but the Floors! Floor Registers, Cleaners, And Much Much More! Use your smartphone to scan this code and go directly to our Site!